Update: Another update Oxygen OS 4.7.2 is now available for download. It brings optimizations to fingerprint, face unlock. Improvements to EIS during 4K recording,Wi-Fi WPA2 security patch, and much more. Download and install the latest firmware update via stock recovery. OnePlus 5T is the latest Android device from the emerging smartphone manufacturer. As always, it comes with all the top-notch hardware specifications currently in trend. OnePlus 5T specifications include Snapdragon 835 processor, Adreno 540 GPU, an option to choose between 6 GB and 8 GB RAM, and 64/128 GB ROM. This stunning hardware is supported by the new Oxygen OS 4.7.1 firmware which is very close to stock Android experience. It has no bloatware so the system transition is smooth, has better battery life, and ready for customization. The first every build for OnePlus 5T comes in as Oxygen OS 4.7.1. It is still based on Android 7.1.1 Nougat. If you are wondering, being the OnePlus flagship, why isn’t the device running the latest Android 8.0 Oreo update. Well, the manufacturer has other plans for the device. Now that the official Oxygen OS 5.0 has been released for OnePlus 3/3T based on Android 8.0 Oreo, the same may come to OnePlus 5 and 5T with the very first build Open Beta program. According to OnePlus’ official statement, the Android Oreo Beta program for OnePlus 5 and 5 T will start right this month; which is November 2017. The two phones will get the same Open Beta version at the same time. Also, the official Oxygen OS 5.0 for OnePlus 5/5T will be released by early 2018. Hence, the following guide will be helpful for any future OxygenOS updates for the device. Stay tuned for more such updates. What’s new with Oxygen OS 4.7.2? How to install OnePlus 5T latest Oxygen OS 4.7.2? Note: The downloads are located at the end. So you get an idea of what we are doing before you get to downloads. This tutorial will help you install any future OTA updates which will come to the Oxygen OS 5T. All you have to do is download the latest OxygenOS full stock firmware package and do a Local Upgrade. Also, use the method if your device is facing any problems like lag, battery drain, bootloops, etc. It will re-install the Android system keeping all your apps and data intact. Here, we are going to use the Local Upgrade method to install it using stock recovery. Read the detailed tutorial: How to install OxygenOS update using Local Upgrade option? If your OnePlus 5T is rooted with latest TWRP, then you can still use this full stock firmware and flash it without wiping anything. 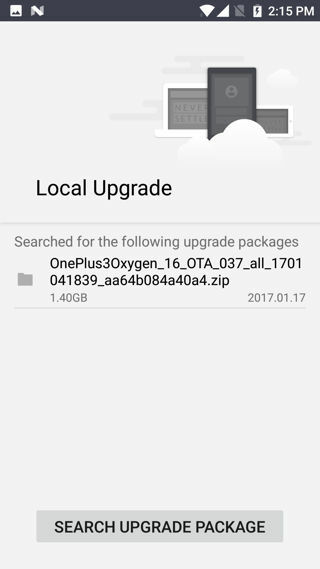 Step 1: First, download the full Oxygen OS stock firmware package from below for OnePlus 5T. Step 2: Transfer the firmware file to the root directory of you phone storage or SD card. This means, do not keep it under any folder. It should be outside. Step 3: Now go to Settings> System update and tap on the top right settings icon. There you will find the option Local Upgrade. Select it. Step 4: The Local Upgrade option will search for the latest Oxygen OS update package. Step 5 : Once you see an upgrade package, tap over it and then hit the install option. The following is the very first Oxygen OS build for the OnePlus 5T. Hence, there are no OTA updates. It comes with firmware build OxygenOS 4.7.1 which can be used to flashed via stock or TWRP recovery. Follow us on social media. Source for image.